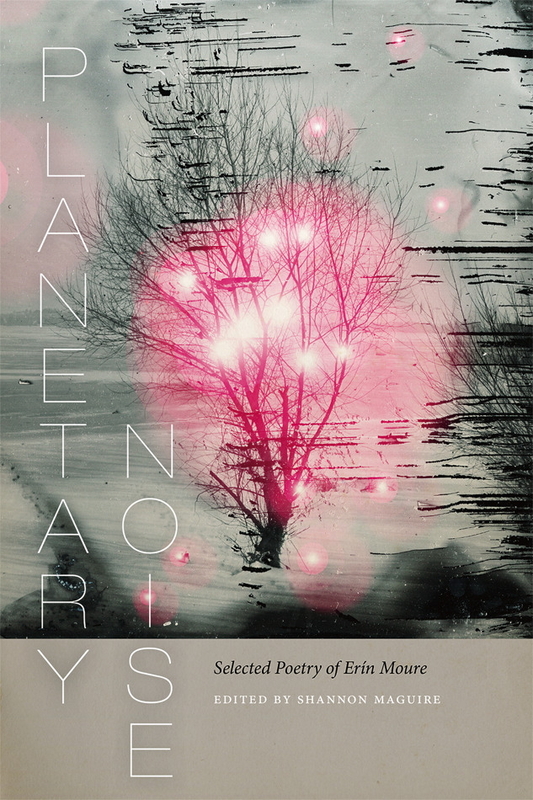 Planetary Noise, Erín Moure. Wesleyan University Press (2017). Planetary Noise—a new collection of Erín Moure’s poetry edited and with an introduction by Shannon Maguire—engages in an intriguing form of synecdoche. It reveals how the mutation, creation, and exchange that happens on the surface of linguistic systems can teach us about all systems. It rigorously decodes the various schemata that dictate our lives, keeping the specters that haunt them exposed. Investigating words, the ideas they are tethered to, and the gulf between essence and representation, is, for Moure, a way to understand how processes of meaning-making are played out not on the page alone, but through all registers of human experience. The poet’s works eschew the flattening of words into platitudes, favouring instead language which inhabits, as Maguire notes, the lungs along with the hands: “those organs of power and insistence, organs of tactility.” Moure’s interest in the latent, subliminal, and subconscious, fosters a unique understanding of how the mind and body shape, and are shaped, by the world around them. She exhumes the subtext of Western civilization, holding it up to the text written upon the cultural memory of those who live under it. In her previous collection O Cidadán for instance, she writes, “When ‘my language’ fails, only then can we detect signals that harken to a porosity of borders or lability of zones.” Planetary Noise exhibits this same attunement to hidden signals, to porosity: the ratio of a given material which is empty space (yet which, on a microscopic scale, can never truly be empty), and to the potential energy wound up in the shifting fabric of received and constructed meaning. In embracing liminal spaces and exploring the entanglements we navigate every day, the poet allows the act of translation to bridge the gap between the solipsistic and the shared. Planetary Noise attempts to reconcile the artistic project of expressing the inexpressible with the disorientation it can produce, the larceny of storytelling with the keepers of stories. Drawing attention to the eclectic interests and motifs which Moure brings to Planetary Noise—ranging from the quotidian to the metaphysical to the sociopolitical—Maguire cites a poem from the author’s earlier collection, Furious. In “Snow Door,” “Insects—who appear dead between double frames but are about to wake up after winter hibernation—adjoin the writing body in the struggle and confusion of spring.” Planetary Noise allows these human capacities for metaphor, identification, and empathetic projection to demonstrate how humans are always, in some way or another, engaged in the act of translation. Moure is an accomplished translator of poetry and other texts across numerous languages, and the mechanisms behind systems of interpretation are accordingly examined throughout the book. Yet it is not just words which are translated in Planetary Noise, it is also the self. Translation of the self to and by other selves is posed as a reciprocal act of loss and gain, push and pull; conditions which the poet frames as essential for positive transformation. The position her poems speak from is frequently that of the “Isthmus// Which honours ‘the space between’ and does not produce a subject/ object / relation.” In this way, the poet allows subjects to encounter each other on even ground, acting not as antithetical forces, but as surfaces which pass through one another and leave parts of themselves behind. The poems in Planetary Noise exhibit a keen awareness that language and storytelling are forms of commerce and transaction, but that all forms of commerce and transaction are fraught with power dynamics. “Seebe,” a poem which begins with “The mind’s assumptive power/ The assumptive power of the mind over the mind,” addresses how stories, experiences, and bodies are colonised. The speaker notes that “in all claims to the/story, there is muteness. The writer as witness, speaking the stories, is a lie […] Because the speech is the writer’s speech, and each word of the writer robs the witnessed of their own voice.” As a poet deeply invested in issues surrounding queerness and working class populations, Moure both embraces the necessity to make strong claims and addresses the dubiousness of the claim as an act carried out in a patriarchal society. In “A History of Vietnam & Central America as Seen in the Paintings of Leon Golub, Musée des beaux arts, Montreal, 1985,” the speaker states: “Several parts of this poem are encoded to prevent theft/of language. / Several parts of this poem are encoded by theft, / to prevent language.” The word is exalted in Planetary Noise, but its status as property and capital announces the need for it to be reclaimed. These subversive aspects of Planetary Noise are complicated by another loaded position the poems tend to occupy: that of the philosopher. The philosopher, after all, professes to mediate between knowledge and opinion, appearance and reality. In “The Acts,” a poem which provides rare insight into Moure’s process and principles, the speaker says, “I can just use the/ ordinary words in their street clothes.” The poet’s inclination to adopt the voice of erudition while discussing subjects like identity and metaphysics, meanwhile, suggests otherwise. But does intense study and extensive knowledge have to be associated with elitism? Yes and no. While Moure has spent much of her life and career operating outside of academia, her work often reads as esoteric in its use of jargon and allusions to formidable theorists and philosophers like Foucault and Derrida. Much like these figures, Moure’s words can at times deal in so many abstracts that one feels compelled to translate them back into colloquial language in an effort to understand exactly what’s being said. The poet’s comfort with abstraction, it should be noted, is an artistic disposition always liable to draw accusations of celebrating unintelligibility. This assessment is commonly used to lobby against more cerebral or conceptual writers and visual artists. In her introduction, Maguire notes that in order to read Moure’s work properly, “it is important to be as receptive as possible to discomfort, to insatiability, to ‘the edge of confusion.’” The idea of being able to read a text properly or improperly is embedded in this comment, but like most ideas in Moure’s book, it is a testament to the latent potential in the act of interpretation. It can be seen as either embracing undemocratic principles or rejecting demagoguery. Works by intellectuals like Foucault and Derrida, after all, are liable to appeal primarily to a white-collar sensibility afforded the leisure and resources to encounter them as artifacts relevant to one’s own experience. Yet Planetary Noise seems to have implicit faith in the ability of blue-collar populations to, like Moure herself, decipher these authors for themselves without a formal education. All art and literature that is hard to categorize has been repeatedly indicted as appealing to vagueness and glorifying cryptic nonsense. Moure writes in her postface that poetry “leans strongly on juxtaposition, and on the ‘productive ambiguities’ at work in language in any idiom.” She notes that “this conjunction of multiple reading axes is what” she has “elsewhere—wryly—called ‘the university,’ for it is these convergences and divergences that make discussion of texts possible.” Though in the language of alienation, Moure insists on creating a dialogue between audience and creator. She writes primarily in what her poem “break simply with grief’s cane” dubs “English, the language of no one.” In “The House Which Is Not Extension but Dispositio Itself”, she also speaks of “the head, chief member of the body.” Yet Moure, even at her most mystifying, is immediately felt and understood on some subconscious or visceral level. In Planetary Noise, disorientation means asking questions, and asking questions means refinement. And for Erín Moure, tinkering is always sure to foster creative growth, uncover new dimensions of signification, and push artistic frontiers.